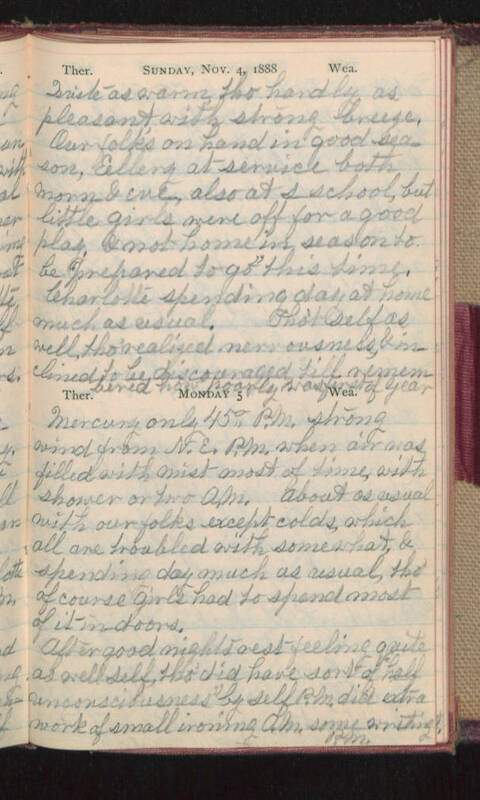 Sunday, Nov. 4, 1888 Quite as warm tho hardly as pleasant, with strong breeze. Our folks on hand in good season, Ellery at service both morn & eve, also at s-school, but little girls were off for a good play, & not home in season to be "prepared to go" this time. Charlotte spending day at home much as usual Tho't self as well, tho' realized nervousness, & inclined to be discouraged till remembered how poorly was first of year. Monday 5 Mercury only 45° P.M. strong wind from N.E. P.M. when air was filled with mist most of time, with shower at two A.M. About as usual with our folks except colds, which all are troubled with somewhat, & spending day much as usual, tho' of course girls had to spend most of it indoors. After good nights rest feeling quite as well self, tho' did have sort of "half unconsciousness" by self P.M. did extra work of small ironing A.M. some writing P.M.